Three Nigerian scammers who befriended many of their victims on dating sites have been slammed huge prison sentences by a Mississippi court, after making tens of millions of dollars from their schemes. Oladimeji Seun Ayelotan, 30, was sentenced to 95 years in prison; Rasaq Aderoju Raheem, 31, was given 115 years; and Femi Alexander Mewase, 45, got 25 years behind bars. A court in the Southern District of Mississippi had, in February, found them all guilty of crimes, including mail fraud, wire fraud, identity theft, credit card fraud and theft of government property. Dating back to at least 2001, the scammers were involved in multiple internet fraud schemes, resulting in losses in the tens of millions, according to the Department of Justice. It claimed that they would befriend women on dating sites, establish a romantic relationship and then either get them to send money or have them participate in fraud schemes, usually without the victim’s knowledge. The unsuspecting women would sometimes be required to cash counterfeit checks and money orders; use stolen credit card details to purchase goods; and use stolen personal information to take over victims’ bank accounts. They were also apparently used to launder money via Western Union and MoneyGram, and re-package and re-ship goods obtained fraudulently. A whopping 21 defendants have already been charged in this ongoing case, 12 of whom have pleaded guilty to charges involving conspiracy and 11 of whom have been sentenced. 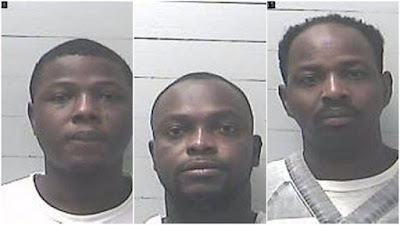 The three Nigerians were among the six extradited from South Africa by US Department of Justice in 2015 to face charges of running a series of scams against gullible Americans over the past 16 years. Fourteen others resident in the US were also arrested to face trial in Gulfport, Mississippi, on nine federal charges, including conspiracy to commit identity theft, wire fraud, bank fraud, theft of US government funds, and conspiracy to commit money laundering. The indictment states that since 2001, the accused were part of a string of scams against Americans, facilitated by internet communications. These include the long-standing 419 scheme, whereby a massive windfall is promised once a small number of payments have been provided, but the Department of Justice claims it went much further than that. The team was also accused of running romance stings to bilk the lonely of funds, shipping fraud, running fake work-from-home businesses, check fraud, and plain-old hijacking of other people’s bank accounts and credit cards to divert funds. Global fraud continues to grow, thanks to the internet and an increase in the use of both anonymising technology and robots designed to mimic human behaviour.